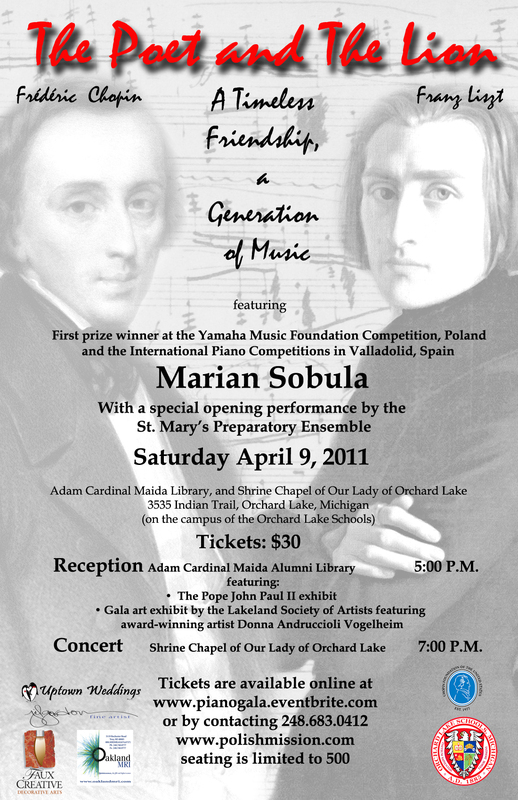 ORCHARD LAKE, MI – The Polish Mission of Orchard Lake Schools, in cooperation with the Chopin Foundation of the United States and the Edward and Josephine Wikiera Foundation, will host a concert by Yamaha Music Foundation First Prize Winner, pianist Marian Sobula. The Poet and the Lion piano concert event commemorates the beautiful friendship between legendary pianists Frédéric Chopin and Franz Liszt, and will open with a special performance by the St. Mary’s Prep Ensemble. The event will take place Saturday April 9th. Tickets are $30, and the event will include a reception at 5pm in lower level of the Adam Cardinal Maida Alumni Library for exquisite Hors d’œuvres where guests will view a special art expo by the Lakeland Society of Artists. The featured artist is renowned watercolorist Donna Andruccioli Vogelheim. The concert will begin at 7pm in the Shrine Chapel of Our Lady of Orchard Lake, where the St. Mary’s Prep ensemble will open with three historic pieces specially selected from our archives. Marian Sobula won first prize at the Yamaha Music Foundation Competition in Bydgoszcz (Poland, 2005), and also at the International Piano Competitions in Valladolid (Spain, 2005), Citta di Ancona, Foggia, Gorizia (Giulio Pecar), Pordenone (Luciano Gante), and Sulmona. He was also a medalist at the Maria Canals Piano Competition in Barcelona in 2001. In 2007 he received the Special Prize during the Dr. Luis Sigall International Music Competition in Vina Del Mar, Chile. Sobula also received awards and scholarships from many international foundations and institutions, such as UNESCO in Paris, The Ministry of Culture and National Heritage in Poland, and the Government of Italy. In July of 2008, he received the prestigious “ARS QUAERENDI” award from the City of Krakow for his remarkable activity in cultural development and promotion. Sobula has performed in Zelazowa Wola, Wawel Castle in Krakow, the Royal Castle in Warsaw, Am Gasteig in Munich, Beethovenhalle in Bonn, the Auditorio Parco della Musica in Rome, the Salle Invalides in Paris, the Bosendorfer Saal in Vienna, the Concert Hall Center in Minneapolis, the Seymour Theater Center in Sydney, Denki Bunka-Kaikan in Nagoya and the National Philharmonic Hall in Warsaw. Seating is limited to 500. Tickets can be purchased for $30 by visiting www.pianogala.eventbrite.com or by calling 248.683.0412. Tickets will also be available at the door.